Our brains are mostly divided into two hemispheres. They each have their own way of responding to conflicts, although there is some overlap. Our brains are really a combination of parts that serve different purposes. They take turns in dominating our thinking at times and generally work together – just as we have many muscles in our arms that work together rather than just one muscle. Our brains are very flexible and the location of brain activity for different purposes varies somewhat person to person. 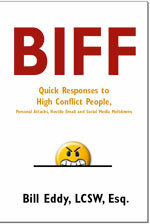 My comments about the brain throughout this book are based on reading research, attending seminars, and seeing what works in the practice of conflict resolution. I’m not a neuroscientist, so this book is meant to be practical and general, rather than scientifically exact. 1. Fast defensive reacting, which appears primarily associated with the right hemisphere of our brains (the “right brain”). This brain can respond in just a few thousandths of a second, to get us out of a bad situation before we even start to “think” about it. It’s probably saved your life many times (almost falling off a cliff, escaping a bully, a run-away car, a flood, etc. ), especially when you were a young child. It’s an action-oriented response, so it doesn’t have time or energy for analyzing situations. In fact, when upset enough, the amygdala in the right brain shuts down our logical thinking. It focuses on a fight, flight or freeze response, that sees people and situations in all-or-nothing terms, that jumps to conclusions and is driven by intense emotional energy (especially the energy of fear and anger). The amygdala acts like a smoke alarm – it gets all of your attention and doesn’t leave room for slowly thinking things through. 2. Logical problem-solving, which appears primarily associated with the left hemisphere of our brains (the “left brain”). This brain is much more accurate in analyzing problems – when there’s time and it isn’t shut off by the right brain’s amygdala. This brain can look into the past objectively and compare the present situation in depth, to see how similar and how different it is. The left hemisphere is more logical and careful. This hemisphere can take the time to plan logical responses to a situation and consider the distant future consequences, which the right hemisphere doesn’t have time for in a crisis or life- threatening conflict. While intense and negative emotions are mostly processed in the right brain, the left brain tends to be the location of feelings of calmness, contentment and safety – which helps you concentrate on problem-solving. While these two “brains” generally work together well, one is usually in charge. Which brain will dominate is generally affected by what is going on at the moment – what is happening around us. Most of the time, the left brain is dominant. But when a situation feels threatening enough or totally new, the right brain becomes dominant. Once a crisis passes or we have learned how to deal with the new situation, then we return to the left brain being dominant. As children grow up and become adults, they become more able to tell the difference between a crisis and a minor disagreement or problem. This comes from millions of experiences, as neurons are constantly growing connections in our brains, associating problems in life to our successful strategies for solving similar problems in the past. Much of this wisdom seems to be stored in the left hemisphere of the brain. Blamespeak, in particular, seems to trigger our right brain response to crisis or conflict, which stops our logical thinking and makes us agitated to get ready for action. This makes sense, because Blamespeak is a personal attack, even if it’s just a verbal attack. When exposed to the intensity that high-conflict people use in their Blamespeak, we get emotionally hooked (the right amygdala gets triggered) into defending ourselves. But logically there’s no need to defend yourself, because “it’s not about you.” You don’t have to prove anything. But emotionally it’s hard (but possible) to override personal attacks. We have to train ourselves to remember during a high-conflict moment that it’s about the HCP’s inability to manage his or her own emotions and behavior, so we can switch ourselves back to our logical problem-solving left brains. There’s often no action we need to take at all. Of course, you may need to take action to protect yourself if there is a physical or legal threat. But you don’t need to defend your own actions or prove who you are as a person.